For various reasons I did not blog about mobile Web compatibility updates in September. Here then, are some highlights of what’s new in mobile Web compatibility this past month. Jason Smith and I presented Opening Up the Mobile Web for Firefox at MozCamp EU 2012, in Warsaw, Poland. 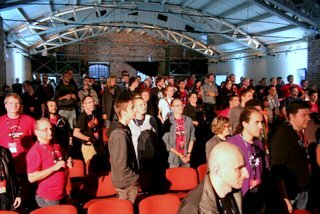 (My summary of MozCamp EU.) The session was well attended and, going off script, resulted in a lively discussion about the implications of mobile Web compatibility for Firefox and for the Web. Jason and I are looking for additional opportunities to share this material and get people actively involved in testing mobile sites. The Firefox OS user agent (UA) has dropped the “Android” token again. In order to mitigate against sites that will not serve mobile content to Firefox OS before it ships but do serve mobile content to Firefox for Android, a whitelist mechanism has been added to override the UA on a per site basis. The policy for how a site is added to this list is being discussed on the dev-platform mailing list. There has also been discussion on the dev-platform mailing list about whether to include hardware tokens in the UA. It seems some hardware vendors use this type of mechanism for various promotions. For example, customers of a specific hardware vendor may have free access to an event’s videos. There are, as expected, a number of arguments against this type of change to the UA. The A-Team had a bit of a setback with the development of Spade due to a loss of resources. Clint Talbert and Mihnea Dobrescu-Balaur are now working to stand this tool up. As I write this the tool is running a test job. If all goes well the initial results should be available in a week or two. We expect this tool to give us insight into the percentage of the top Web sites that have a mobile version, the percentage that make use of UA sniffing, and the percentage that make use of non standard CSS properties. microsoft.com has been rebuilt as a responsive site that seems absent of any UA sniffing. This is great news and I hope starts a trend with other Microsoft Web sites. Brightcove, a prominent video platform, is currently broken on Firefox for Android as it does not detect that Firefox can play H.264 content. Investigation is tracked in bug 794171. 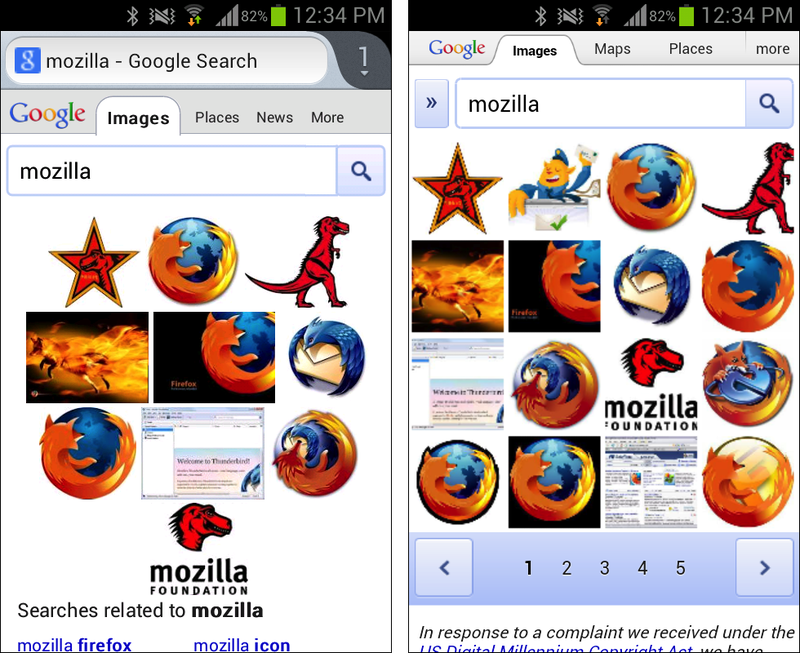 The layout of Google images search is nicer in the Android Stock and Chrome browsers. More images returned per page, the grid layout is structured better, and the page menu is more easily accessible. 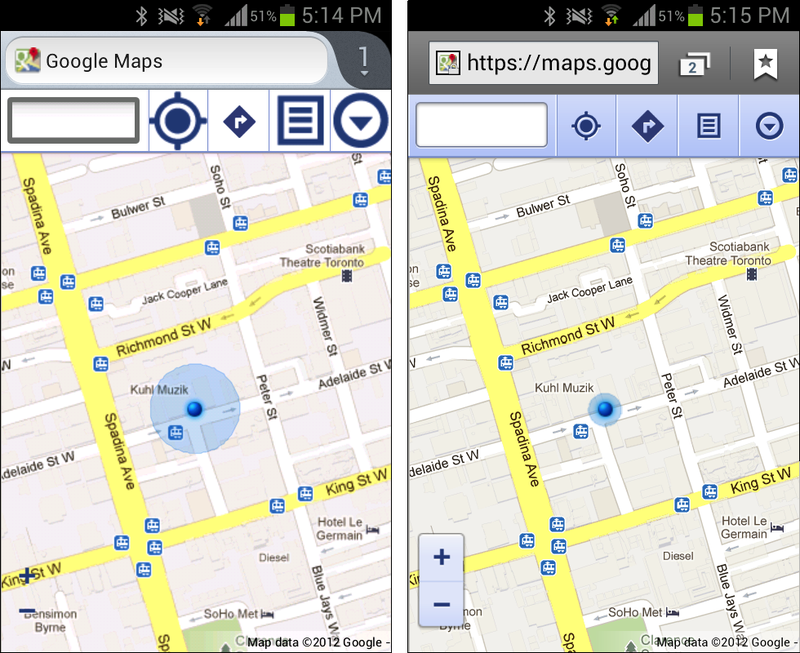 Similarly, Google maps design is not as pretty in Firefox as it is in the Google browsers. Firefox also does not have access to street view, which was recently released as part of the mobile Web based maps app. In order to handle video served by YouTube, the Firefox OS team has built a video Web activity into the platform. As a great example of the community taking ownership over a portion of test coverage, Pavel Cvrcek has started testing Czech Web sites for mobile compatibility. His results are tracked in bug 794622. Firefox Input now displays any URL submitted by the user along with their sad feedback. This is a new and good source of site issue reports. I suggested that it would be beneficial to know for what sites a user selects the Request Desktop Site option in Firefox for Android. Knowing the sites should give us a view into whether the mobile version of the site is broken or whether users prefer the desktop site in some cases. Brad Lassey has a speculative patch for a feature that prompts the user to submit the site. Discussion is taking place in bug 790614. The Firefox for Android team has received user feedback that desktop sites have usability problems on mobile. One specific case that was mentioned is that it is difficult to interact with menus that appear when the mouse hovers above them. While this type of issue is expected from desktop sites in a touch environment, the question is how should the team address this concern? Do users prefer the desktop site? (It may be preferable on a tablet.) Are users requesting desktop sites with the Request Desktop Site feature vs being served desktop sites by default? Are users using this feature because the mobile site is broken? Is the mobile site preferred by the user? The answer to these questions should give us guidance on how to proceed with technical and evangelism solutions to these issues. Please leave a comment or submit Firefox Input (in Firefox, Help->Submit Feedback…) with your feedback. The CSS3 flexbox implementation has landed on the Firefox Nightly 18 channel. This feature is currently disabled due to some test failures and the layout team is working hard to enable it shortly. This entry was posted in mozilla and tagged css, firefox os, microsoft.com, mobile, mozilla, spade, user agent, web-compat. Bookmark the permalink. The street names on Google maps also looks notably clearer in the stock browser than in Firefox. I wonder what to chalk that up to? Is the Google Maps issue reported to Google? A number of issues with various Google sites have been reported. I am following up to determine if the maps specific issues were reported.